This first sentence pulled me straight into this beautifully crafted novel by Sarah Waters. This is only my second novel of Waters that I've read and already she's becoming one of my favourite authors. Fingersmith is such a wonderful novel, with with fun characters, a complex and twisted plot, and her writing style is so rich and full of detail. Sue is an orphan living in Victorian London in a houseful of thieves and petty criminals. After Sue's mother was hanged for murder, Sue has been raised and protected by Mrs Sucksby, a woman who takes in unwanted babies and sells them on. I adored the various characters in this London house. There's Mr Ibbs who buys stolen goods and then melts down the silver and gold. There's John Vroom who steals dogs and has his girlfriend Dainty sew the dog skins together into a coat a la Cruella de Vil. And then there's the well-known conman, Gentlemen, who comes to Lant Street with a proposal. He has heard of a rich young woman, Miss Lilly, in an isolated estate in the country who can only come into her fortune by marrying. He wants to Sue to become her maid and nudge her into marrying Gentleman so that they can take her money and place Miss Lilly into a mental asylum. Sue agrees and off he go on a wonderfully twisty, turny storyline. As I've said, I love the characters, not just the poor criminals, but Miss Lilly, her mad old uncle, Gentleman. Sarah Waters paints each setting, both in London and out in the country with such vivid detail that I could picture myself alongside Sue picking locks and feel the isolation of Maud Lilly. 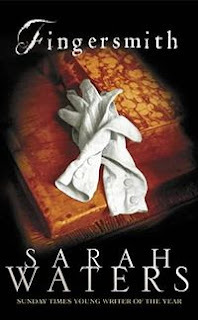 Sarah Waters wrote these characters so well and so convincingly, that even whilst the villains did horrible things, and the other characters make surprising choices, I still felt sympathetic towards them. I liked Sue and Maud's unlikely friendship slowly that slowly built over the course of the novel, their guilt and helplessness of both of their situations. Until the very last page of this 500+ book, I was hooked. It took me three days to read this and I hated it everytime I had to put it down and carry on with my day-to-day activities. I wish I was the type of person who wrote down memorable passages of a book to share with you, but I don't. You just have to take my word that this is a wonderful read. Highly recommended. Great review! You've made me want to read this book! I'm moving this up the pile right now! Three days to read 500+, that's good going. I am glad you liked it. Great review. S Krishna and Nymeth - do! You won't be disappointed. I'm trying to get hold of a copy of Tipping the Velvet now. Can't seem to get enough of Sarah Waters! Scrap Girl - It was good going, I don't find a lot of books that are that engrossing. This is one of my favorite books as well. She's such an amazing writer. Which other book have you read? I just read Affinity last month--and loved it, too (Fingersmith is still my favorite, but it was excellent as well). I'm really looking forward to her new book coming out this spring!